The Agenda extension enables to add events in the calendar of the user using the native agenda application installed on the device (for example the Google Agenda application on Android or the Calendar application on iOS). The event will be created thanks to the extension and then the insertion work will be delegated to the native applications. Note that if there are several applications that can open a calendar, a popup will notify the user and he will be able to choose the calendar application he wants. The result of the insertion will be available in our application thanks to callbacks to notify the user if the action was a success or a failure. To be able to use the extension in your IDE and the autocompletion feature for example, please refer to the section: Importing an extension in the IDE. 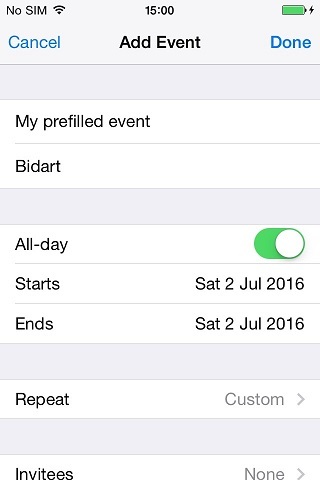 This will just open the calendar application on an empty event creation screen. With some OS versions and some native applications, after the user inserted the event he will stay in the calendar application. He will have to exit it to go back to your application. Before inserting events in the user’s calendar, they can be filled in the application with various properties detailed in the following sections. The basic properties of an event are its title, its start date and its end date. Without these properties it seems difficult for an event to exist. Let’s see how to create such an event. And we are done. As suggested in a previous section, properties set in the code can be modified by the user before confirmation. Note that there are other simple basic properties such as the description or the location that can be use the same way. Refer to the javadoc to have the complete list. That’s all, simply use withAllDay(true) method. By default, an event occurs a single time at a given date, however recurrence can be added to the event if we want it to be repeated in time. Of course, once the recurrence created, you will have to add it to your event to apply it. 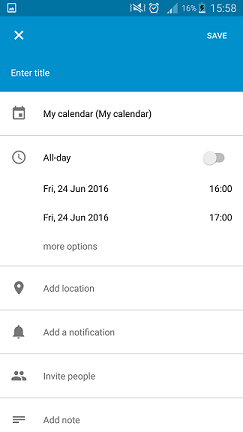 A user may want its calendar to remind him its calendar’s events automatically with a notification or something else. 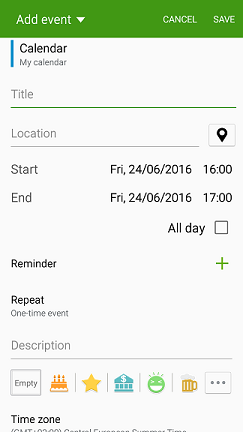 This can be done by adding reminders to your event. Once the reminder created it must be added to the event to trigger. Either a single reminder or a list can be added to the same event. 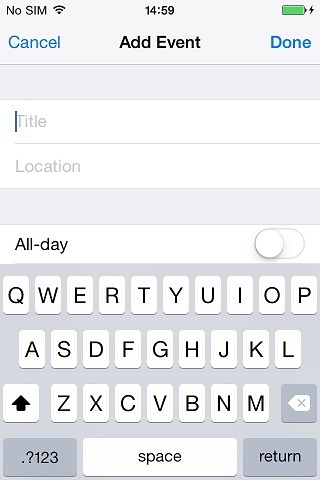 This functionality is currently available only in iOS platform. Calendar’s applications often enables to add invitees for an event. After the user adds the invitees, the application will send invitations to the invitees e-mail address. The extension enables to create such invitees and to add them to an event. Let’s see how to create an invitee. Once the invitees created, they must be added to the event. As for the reminders, either a single invitee or a list of invitees can be added at the same time for a single event. This functionality is currently available only in Android platform. In general, several events can happen at the same time in a calendar. However, the user may want to remove that possibility for a specific event. If my calendar is shared with several users, how can I create an event but hide its details from them ? e.g. I have a meeting but I do not want to share the place and the people participating. Once your event created (see: Creating events with the extension), it is really easy to add it in the user calendar. This will open the user calendar application with the event filled. Of course, if there are several calendar applications on the device, a popup will be prompted to the user and he will have to choose the application he wants to use. Let’s see several examples of native agenda application insertion page. The Agenda extension provides a mechanism to handle the result of an event creation request. The result is stored in an AgendaEventResult object that allows to check the request status and the created event. This object is accessible through the AgendaEventCreatedListener interface, which is a callback that can be linked to the manager when creating an event. The Agenda extension is not implemented for Windows and Windows Phone. Events can be created however they cannot be inserted with the manager. A RuntimeException will be thrown saying the functionality is not implemented. The exception can be catched to perform a specific action on these platforms.